Snow showers are expected to become increasingly frequent over northern Scotland late on Thursday and are expected across many other parts of Scotland, Northern Ireland, Wales and western England on Friday. 2-5 cm of snow is likely for some, with 10-20 cm possible over high ground, mainly Scotland, Northern Ireland and Wales. Icy surfaces are also likely to be an additional hazard, especially overnight. Strong northwest winds may cause drifting of the snow in places with blizzard conditions possible at times across northern Scotland. The heaviest and most frequent of the snow showers will progressively become confined to northeast Scotland during Saturday. 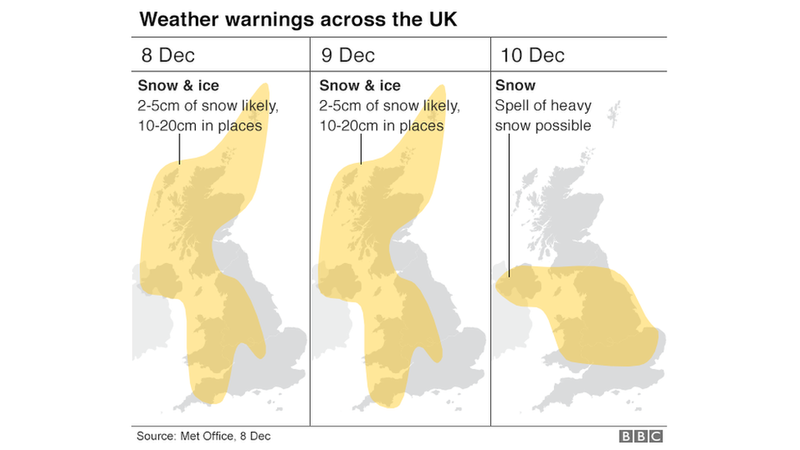 Some roads and railways likely to be affected with longer journey times by road, bus and for train services.Probably some icy patches on some untreated roads, pavements and cycle paths. Some injuries from slips and falls on icy and snowy surfaces. It’s why weather forecast need to be more accurate. I don’t care about climate forecast they will never be accurate but short term are very important. I’m travelling 830kms in france and 400kms in UK on one day in the next week. because I cannot risk trying to do it in snow I have had to bring forward my departure 4 days to be reasonably sure. The prediction for Friday is still up for review, but we know exactly how it will be in 50 years time!!! Now forecasting a temp drop of up to 10C between Thursday and Friday. Before that, Storm Caroline moving in. Ferry disruption likely, North Sea rigs evacuating. Trouble ahead…windy with a threat of snow. …as the storm leaves on Friday it will cause a new weather front to appear and forecasters warn temperatures in every part of the UK will drop by up to 10C. It is the first time such a drop has happened in over a year. In London temperatures are presently around 12C but by Friday they are expected to be 5C in the daytimes and freezing in the evening. Forecaster Grahame Madge said: “Storm Caroline will bring very strong winds and as it moves away to Scandinavia, winds will start coming from the north and the Arctic. BBC, still the The Met Office?? Probably want more tax-payer money for an even bigger computer model, so that they can predict more misanthropy faster but with no improvement in accuracy. What happened to the Met Office’s claim the last time they upgraded the computer system at public expense? IIRC they said they would much improve the regional and long-range forecasts’ accuracy. Same BS different day! This does look a lot like Tuesday’s forecast, up to a point. No snow in north Cheshire so far, visible western Pennines also clear. OTOH Isle of Man (~80 miles further north-west) has had enough snow to close schools. Snow has fallen across many parts of the UK overnight, bringing power cuts, school closures and some travel disruption. The Met Office said “increasingly frequent” snow showers were affecting parts of Scotland, Northern Ireland and northern England. Schools are closed across Northern Ireland, Wales and Scotland – where 500 homes remain without power. 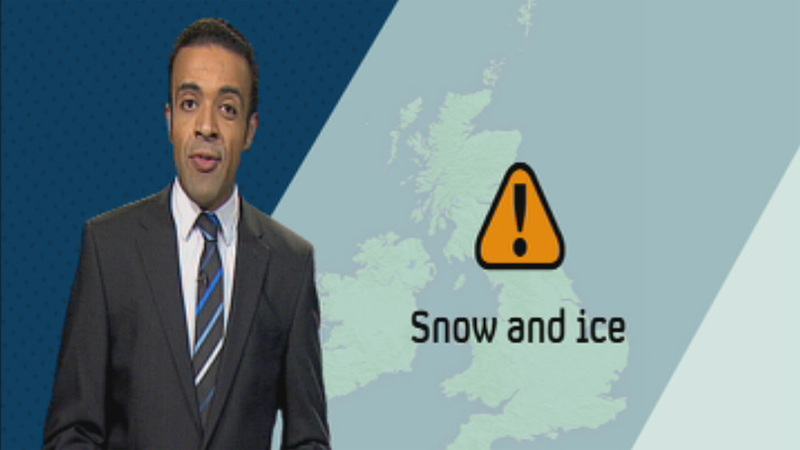 Mainly for central/northern England and north Wales on the graphic, but the video shows a much larger area of possible snow. ‘Some villages in rural areas could be cut off’.